Altrincham Interfaith Group visit to St Peter’s Church, Hale, May 10th, 2017. 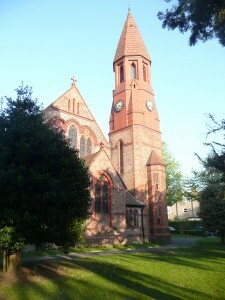 It was a beautiful Spring evening when over 40 members of Altrincham Faith Group, comprising various faith traditions, descended on St Peter’s Church, Hale, as the guests of the Minister Rev. Keith Addenbrooke and his congregants, to learn about the history of the Church and its traditions. We were given a very warm welcome, and Rev. 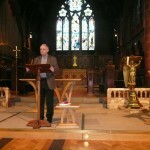 Keith began his talk by describing some of the meanings of the word “church” before telling us about the history of the actual building itself – how the coming of the Cheshire Midland Railway meant that the area around Peel Causeway station was ripe for urbanisation and local people therefore got together to build a place of worship. Meetings began in 1889 and the foundation stone was laid on November 29th 1890, with St Peter’s Church being finally dedicated in 1892. He went on to describe the Church’s “DNA” – various key events that characterised the church which now can be said to be “middle of the road” as far as the spectrum from low to high church is concerned. He then showed us various features of the church – the candles and processing cross which had recently come from St John’s Church, now closed, and the platform which was put in in 2011 and allowed the minister to engage more fully with the congregation. 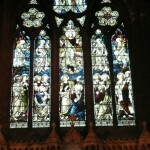 We were invited to walk around in order to admire the many beautiful features of St Peter’s – the stained glass windows depicting angels, the marble pulpit and golden lectern in the form of an angel. After a lively question and answer session we were invited to the adjoining building where a lavish spread of cake and biscuits (including kosher varieties), fruit, and hot and cold drinks were laid out for us, and people could sit down together and chat. The evening closed with the AIG Chairman, Gordon Levy, giving a vote of thanks. 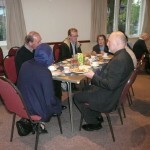 It was a delightful and informative evening and we are most grateful to Rev. Keith Addenbrooke for hosting the event and to the congregants for their kind and generous hospitality, especially for providing kosher biscuits and milk which was much appreciated by the Jewish members of the group.